COLUMBUS, Ohio (AP) Ohio State coach Chris Holtmann warned his team to avoid a letdown after his team’s upset of No. 3 Purdue. A letdown at this point for the Buckeyes would be as hard to imagine as them owning sole possession of first place of the Big Ten in mid-February. That’s where they are after Keita Bates-Diop had 14 points and eight rebounds in No. 14 Ohio State’s 82-64 victory over Iowa on Saturday. Hot shooting at the end of the first half and the beginning of the second propelled Ohio State (22-5, 13-1) to an insurmountable lead against the Hawkeyes (12-15, 3-11). Kaleb Wesson added 18 points and C.J Jackson scored 14 for the Buckeyes. With Michigan State’s win over Purdue earlier Saturday, the Buckeyes are alone in first place in the conference. Following a 7-0 Iowa run that put the Hawkeyes up 18-15, Ohio State rattled off an 8-0 run of its own with a second-chance layup and two layups in transition after forcing turnovers on three straight possessions. Ohio State made eight of its final 10 shots to end the half, which included four 3s to take a 42-32 lead into the break. The prolific shooting spilled into the early moments of the second half for the Buckeyes. Jae’Sean Tate drove the baseline to find Jackson in the opposite corner for a 3, then drilled a rare 3 of his own to highlight a 14-0 run and extend the lead to 18 with 15:49 left as the sellout crowd of 18,809 fans roared for one of college basketball’s most surprising teams this season. Ohio State’s largest lead was 29. Iowa hung around in the first half with 50 percent shooting, but shot just 35.5 percent in the second half as the Buckeyes piled onto their lead. Iowa’s top scorer Tyler Cook had just eight points, and second-leading scorer Jordan Bohannon had 11. For the final 6:36 of the game, Bates-Diop, Jackson and Tate all sat the bench for added rest. Ohio State – a team mostly picked preseason to finish in the bottom third of the league – is leading the Big Ten with just four games left in the season. Iowa, largely picked to finish in the top half of the league, has tumbled to a nearly guaranteed below-.500 team. The difficult part here forward for the Buckeyes will be maintaining the conference lead with three road games left. Ohio State: The Buckeyes are a full game ahead of No. 3 Purdue and No. 4 Michigan State in the Big Ten standings and hold the head-to-head tiebreaker over both teams. The Buckeyes do not play either team in their four remaining games. 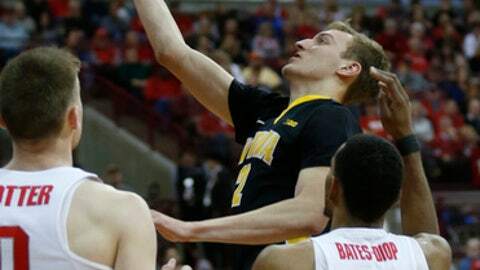 Iowa: The Hawkeyes have lost three straight games and sit two games behind 10th place in the Big Ten, meaning they would be one of four teams to play on the first day of the conference tournament. Ohio State wore black T-shirts with white lettering that read ”Equality” during pregame introductions in honor of February being Black History Month. … Andre Wesson started his third straight game for the Buckeyes while Kam Williams remains suspended indefinitely. Iowa freshman Jack Nunge scored 15 points off the bench, marking a career high in conference play. Ohio State’s next opponent, Penn State, represents the lone blemish on an otherwise perfect conference record. Even if the game hadn’t ended on a 35-foot buzzer-beater, it would be on the players’ and coaches’ minds. Ohio State: Plays at Penn State on Thursday. Iowa: Plays at No. 20 Michigan on Wednesday.